Piano chord inversions are the different ways which you can arrange the notes in a chord. For instance, if you play three notes (a triad), then there are three inversions you can play for that chord. If you play four notes, then there are four chord inversions. If you play five notes, then there are five possible chord inversions. Piano chord inversions help you play the piano in a pleasantly flowing manner without making the music sound too choppy. The chord inversions give you more freedom to move your hands while playing instead of having to stick with the root position for each chord. Triad chords are also known as minor or major chords. The root position is the starting piano chord inversion. This is also known as the parent chord, or root inversion, where all the other inversions start. Typically, you have three keys to a chord. Sometimes you may have four notes/keys or five notes/keys at a time (four notes mean four inversions; five notes mean five inversions). An example of a root chord inversion is the C major chord C, E, and G. The C note is the lowest keynote of the root inversion. This rule also applies to other root inversion chords as well. You would do the same for four-note and five-note chords as you would a three-note (triad) chord. First chord inversion is when we switch the bottom keynote of the chord to the top note. For example, with the previous C major chord we would move to the next C key and play the C at the top so that it plays as E, G, C. This will give the chord a slightly higher tune than the root position. This inversion is often interchangeable with the root inversion. Second chord inversion is taking the bottom note from the first chord inversion and playing it as the new top note. From the previous example of the first chord inversion we had E, G, and C. Now we would move to the next E key on the piano and play the chord as G, C, E.
One method when playing with four notes is C7 which is adding A#. Example: C, E, G, A#. We would then repeat the other inversion possibilities with each note as the bass note or bottom note. A suspended fourth inversion refers to another method when playing four notes in a chord. This may sound hard at first but is relatively simple in practice. What the difference between a regular chord and a suspended chord is that the third note has been replaced by a perfect fourth. An example is we would have the C key and then replace the E key with the perfect fourth F key, this creates the C, F, G chord. The CADD4 is another example for when both the third and fourth are present. 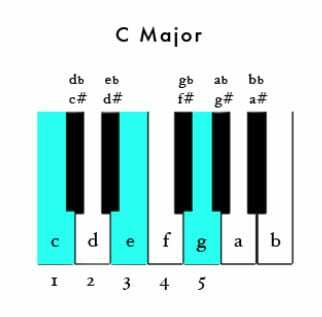 Play the C major with C (the root of this piano chord), E, F (the perfect fourth), and G (the perfect fifth). Alternatively, the minor chord CminADD4 as C Minor C, E♭, F, G.
Practice the major chord triads first and moving between the different chord inversions of each triad to get used to playing the various chords. 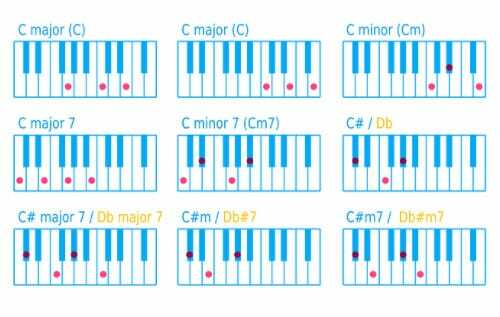 This will help you in discovering how to learn piano chords, and you’ll be playing piano music with little to no issue once you get the hang of the patterns within each chord’s inversions. When you learn each chord, be sure to learn how to play the chords correctly and then practice at the minimum of thirty minutes a day.